As professional nerds, we love role-playing games. And we love web development. 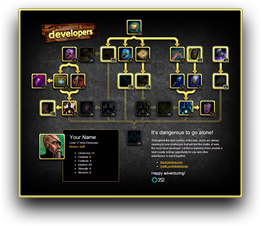 Naturally, we wondered what a character talent tree for a web developer might look like. So, we decided to build one. 352 is a digital agency creating websites, software and marketing campaigns. We came up with Dungeons & Developers as a fun way to assess, promote and learn the skills it takes to design and develop great web sites. This page was built during the "Race to 3:52", our annual company retreat that has every member of the company working in teams on various innovative (and sometimes silly) projects. It’s a pep rally, hackathon and family reunion all rolled into one event. We love this stuff. During our day jobs, we partner with great clients to build smart solutions that drive results. Find out more at 352inc.com. Character illustrations provided by StarkWhite Studios. Built with jQuery and Knockout.